Book your Summer getaway today!! Are you looking for a family getaway? 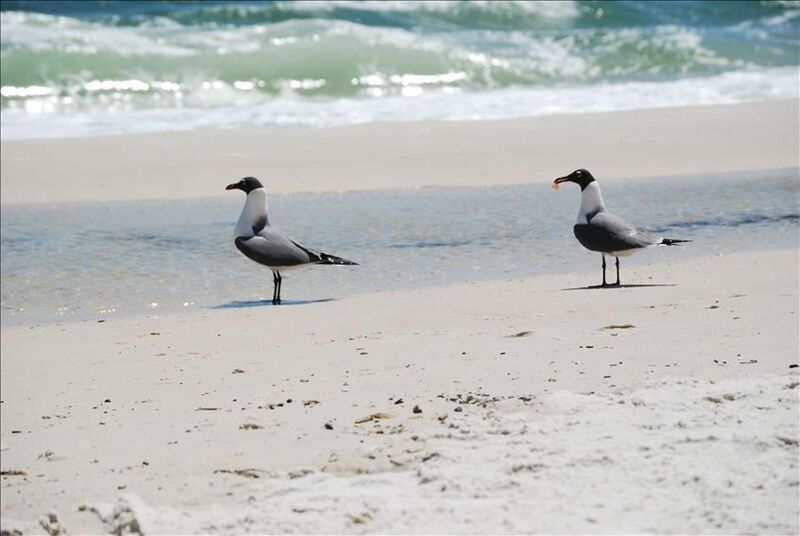 Come enjoy our home away from home in beautiful Gulf Shores, AL. Our unit is a peaceful retreat after a day of swimming, shopping or sightseeing. Enjoy your evening dining in one of our many restaurants, or take in a movie at Gulf Shores new movie theater. Our unit is only 5 minutes from WalMart and 15 minutes to the Tanger Outlet Shopping Mall. The unit sleeps 6 and has two bedrooms and 2 full baths. The master bedroom has a queen size bed with cable television and a private bath. The second bedroom has two sets of bunk beds, with a TV/DVD player. This past December we installed new cabinets with marble counter tops in the kitchen and baths, purchased 2 leather sofas, kitchen table, 32' flat screen for the den, and both bedroom suits along with all new bedding/linens.. If you enjoy cooking you will love our fully stocked kitchen where everything in it is also new. You will love sightseeing, and admiring the direct view of the gulf from our private second floor balcony .There is a table and chairs on the balcony for your early morning coffee or enjoying the afternoon sunset over the gulf water. This is a smoke-free and pet-free unit. We have all the comforts of home including free Wireless internet. The only thing that you need to bring while vacationing in our condo are your beach towels and chairs, sunscreen and your personal items. Las Palmas is located on West Beach Boulevard just one mile from Gulf Shores Public Beach. It's across the street from the Gulf of Mexico and sugar white sandy beaches, to which you have deeded access. Salt water and sand not for you? Enjoy lounging on the deck soaking up the sun or swimming in one of two pools. Picnic tables and charcoal grills are located right outside the fenced in pool area. For your convenience, there is a coin operated laundry room just three doors down from our unit. Each unit has a two car parking garage under the unit. There is parking for boat/trailer at the east end of the property. A security deposit of $150 is required to hold your reservation within 10 days of booking. If no damage is incurred, this deposit will be returned within 10 days of check-out. In addition to rental fees, a one time cleaning fee of $115, and an 11% lodging tax is collected. The rental payment, lodging tax and cleaning fee are due fourteen (14) days prior to arrival. Las Palmas is triangular shaped which allows all of the units a view of the two swimming pools located in the center of the complex. I got what I expected for the price. Property is somewhat outdated and could use a deep cleaning. The location was convenient and easily accessible. The owners answered all correspondence in a timely manner. I would stay again. Very confortable place to relax and soak up some sun!! Just wanted to say thank you for the use of your condo on Gulf Shores. It was a great location and quaint area. Loved that the building had minimal amount of units. I didn't feel overwhelmed with people. Also loved that there were 2 pools unlike the big condo across the street with a tiny little pool! Too bad for them?! So glad when we walked in to see there were bunk beds in the first bedroom. I had 4 teenagers with us and it worked out great! The beach was a very short walk across the street but we still had a great view of it from the unit! My family and I stayed in this lovely little condo for a week. We enjoyed it very much and will use it again when we get the chance. Location is great and handy to everything. Owners were very accessible and a pleasure to deal with. It was a pleasure working with the owners. The condo was exactly as pictured and was located near the center of Gulf Shores. The view across the street to the beach was so nice. We stayed at this condo for 7 days and loved every minute! The condo was very clean and exactly as described. The bed was a little hard for my liking but I'm used to a very soft bed and most other beds are always uncomfortable to me. Both bathrooms were clean and well stocked. If you are staying a week, you might consider taking a few extra wash cloths & towels based on how many stay. The kitchen was fully stocked with dishes and all you need to prepare and eat your meals. we had no problems with anything in this condo! Everything was in working order and very clean. No smells! The wifi worked wonderfully for me. My husband had trouble getting the dvr to work but he does at home too! Lol. We would recommend this condo to anyone wanting a relaxing home away from home vacation and would love to stay here again next summer. The owners were great to deal with and quickly responded to any questions I had before arrival. We didn't interact with them during our stay as there were no problems and had no need to. Afterwards, the damage deposit was quickly refunded. The condo is on the second floor and there is no elevator. This was not a problem for us, we needed the exercise, but anyone with knee problems it might be. I don't want this to seem as if it's a negative comment- only a heads up to other guest. Thank You "owners" for sharing your home with us! We highly recommend this condo! Location was great with good access to beach. Condo was great for our family even though one grandson was on crutches. Condo was as described in pictures and emails from owner. Appearance looked clean but condo is in need of a deep cleaning, air conditioner vent, kitchen drawers and there was a light out in master bath. I would recomend for families with children. **During the summer ALL rentals are Saturday-Saturday.